Creative Connections Art & Poetry Exhibitions (Creative Connections) curates and presents an annual exhibition, which brings together poets from WA Poets Inc. and artists with intellectual and physical disabilities. Since its inception in 2007, it has become evident that artists with an intellectual and/or physical disability have difficulty developing their skills and experience in arts practice. This is common to most of the disabled artists whether they live in their own homes or institutional homes or hostels. While carers/supporters are dedicated in their efforts to provide opportunity and access, there are many constraints including cost, lack of professional artists with appropriate skills, space and transport. WA Poets Inc. has not only recognized the need for celebration and exposure of these artists but has also realized the potential for collaboration between artist and poet; a shared passion and exploration. This is something that has been nurtured, appreciated and above all, valued over the past years. The project aims to provide a series of art skills development workshops, which teach by demonstrating to artists and carers/supporters a range of methods, and techniques that can be easily used by the artist to extend their developmental opportunities and improve their existing techniques and skills. This will increase their quality of involvement, self-expression, choice, personal growth and the recognition of the artists by the general community. The workshops give artists who have an intellectual and/or physical disability an opportunity to explore, experiment and develop colour, texture, clay and other mediums in the same way that other artists do. For many, this will be a rare experience; building on an activity of choice in a dedicated space, something which is on offer to the majority of the art population but often not available to artists with disabilities. The workshops will be based in a community art centre, which will provide an invaluable opportunity to meet, share and network with other artists, make new friends and bring the talents of this group into the wider community. Ability rather than disability will be promoted, self-esteem will be enhanced by sharing and networking and the sense of isolation and separation from community will be reduced. There will be a focus on enjoyment and acceptance of disabled artists capabilities. The workshop experience will also be invaluable as support to carers and supporters by providing strategies, commensurate with the abilities of the artists, which carers/supporters will be able to use to facilitate inspiration and creativity. Artists existing techniques and skills will be improved which in turn will enhance the standard of artwork produced. Augmenting the artwork is poetry penned specifically to the artwork and the artist by poets who are members of WA Poets Inc. This provides a ‘voice’ to the often non-verbal artists. In the past the main contact between artist and poet has been through artist profiles that accompanied each artwork. Through this project, it is intended to provide a series of convenient opportunities for artists and poets to catch up and connect in a community art setting, creating a greater sense of understanding, sharing and camaraderie. improved self esteem of artists with complex needs. improved quality of artwork by artists with complex needs showing enhanced levels of expertise. greater satisfaction develops as artists with complex needs begin to more accurately portray their intentions in their artwork. development of creative and technical goals for artists with complex needs and their carers/supporters to strive for. improved acceptance of artists with complex needs abilities by the community. enhanced cooperation and networking between abled and disabled artists through greater involvement of disabled artists in community arts groups. successful engagement of mainstream Galleries to showcase artwork by artists with complex needs. increased interest from the community (business and private) resulting in offers of help and financial support for future events and exhibitions. professional development of Creative Connections as an organization through greater involvement from the community. 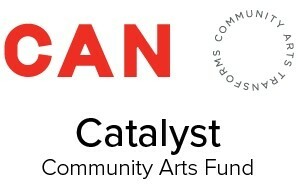 Community Arts Network through its Catalyst Community Arts Fund has provided funding. Community Arts Network manages the Catalyst Community Arts fund on behalf of the State of Western Australia through the Department of Culture and the Arts and is supported by the Mental Health Commission WA.